I think the designer nailed it, with her elegant color palette and choice of white painted furnishings and accessories throughout. Before we move on from this image, I’d like to draw your attention to the lovely French style chandelier with wood tassel finials hanging down from its wire arms. This chandelier is absolutely amazing and a true centerpiece in the room, drawing your eye upward to the vaulted ceiling. 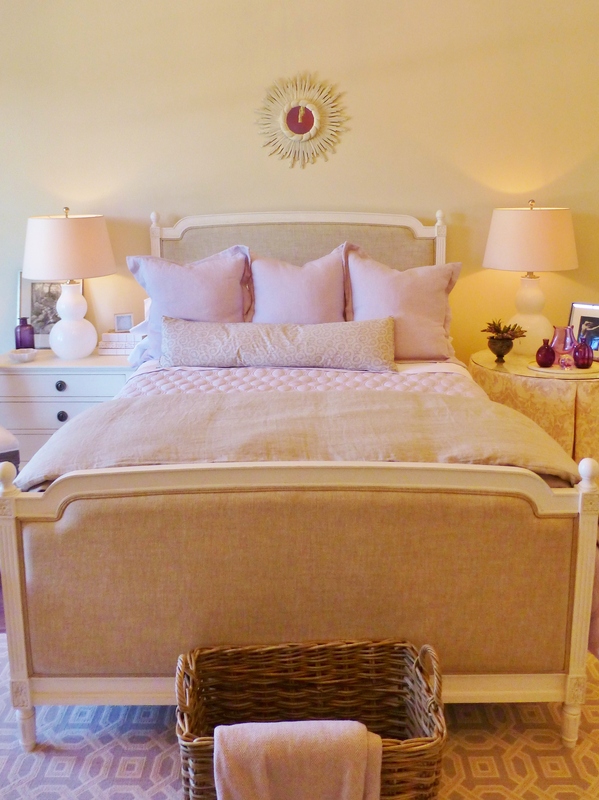 The French linen-upholstered bed is topped by both lavender and linen bedding. The pair of white glass gourd lamps on the side tables are quite pretty, as is the ivory starburst mirror above the headboard. The designer chose to use mismatched end tables on either side of the bed. At the right is this lovely skirted table. The fabric is so pretty with its lavender damask pattern and I really like the added detail of the ivory ribbon tape, applied just a few inches up from the hem. You can also take a closer look at the bedding in this photo. Such a pretty combination of fabrics and textures were used. On the wall to the right of the bed sits this lovely carved wood settee. 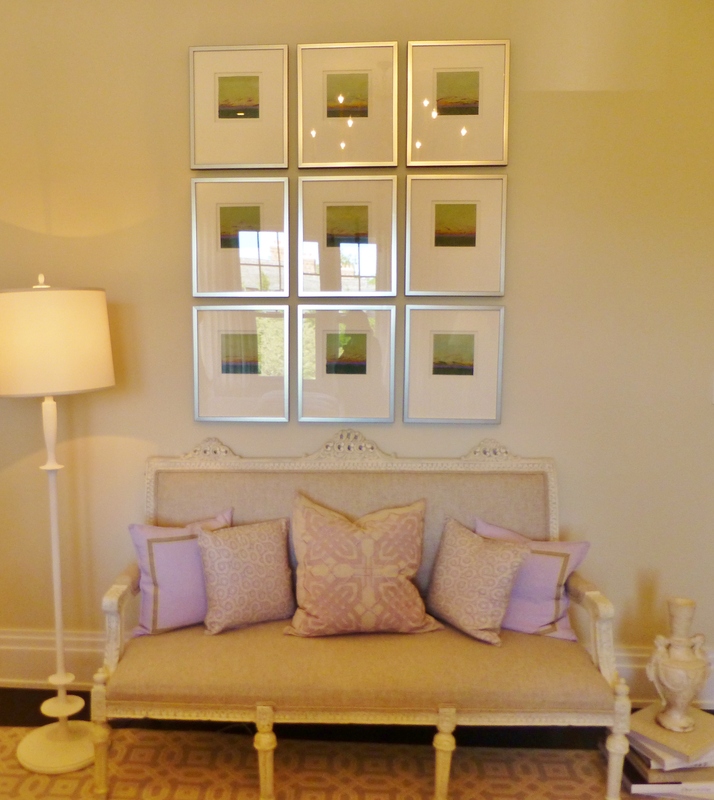 The artwork is hung above it in a grid, gallery style. That’s also a very sleek, modern white floor lamp at the left, a real juxtaposition to the carved settee. I’m sure you noticed those amazing pillows too–they are absolutely gorgeous! What do you think of the urn, sitting atop a stack of books at the right of the settee? It’s very pretty as an alternative to the expected side table. A comfy chair and ottoman reside in the corner to the right. Here’s a look across the room at the corner with the linen-covered chair and ottoman. Notice the extra large floor mirror leaning off to the right, and the pretty white carved wood floor lamp. In this photo, you can also get a better feel for the absolutely stunning area rug in this space. The rug is large enough to cover the entire floor, with just a little bit of hardwood peeking out at the sides. 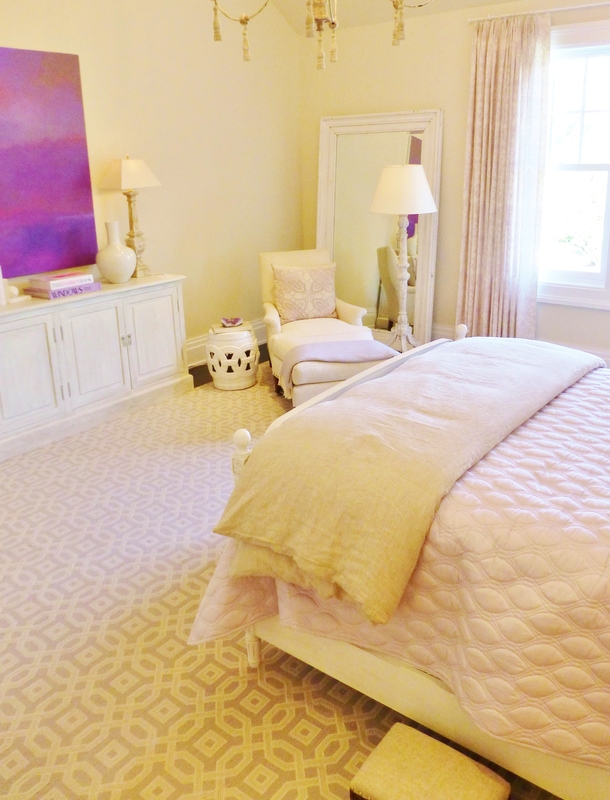 The lavender and ivory trellis pattern is perfect in this soothing bedroom. Here’s a shot featuring the pretty linen draperies. They’re very simple full-length pleated panels in the same printed damask pattern as the skirted table by the bed. These draperies are very elegant and subtle. The scale of the pattern combines beautifully with the area rug. This vantage point also gives you a much better view of that awesome floor lamp over by the chair. It’s heavily carved with a tripod base–gorgeous! 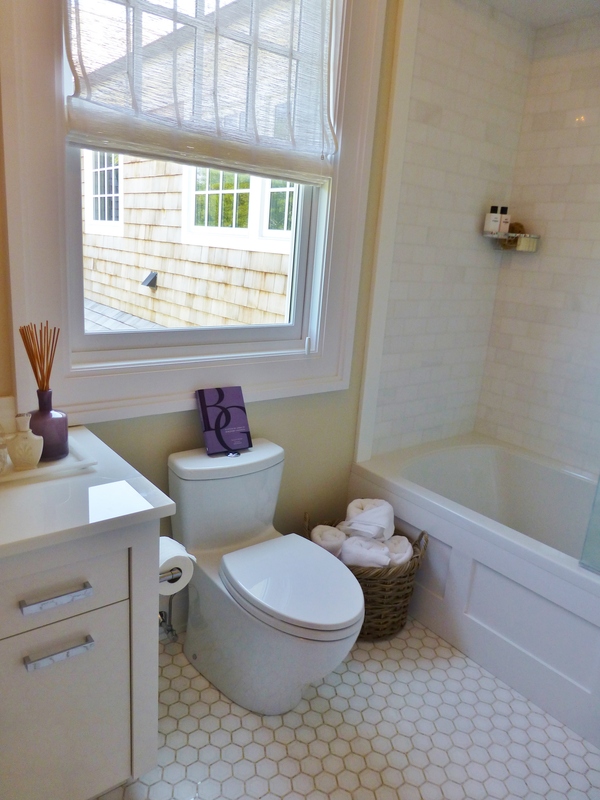 Here’s just a quick peek into the en-suite bathroom. Notice the honeycomb tile on the floor, which is especially nice. The sheer roman shade is also pretty, but doesn’t seem like it would provide much privacy. Purple accessories are used sparingly to continue the bedroom’s color scheme. I’ll leave you with this shot of the bed and its pretty side chair, bedding, and charmingly mismatched night stands. 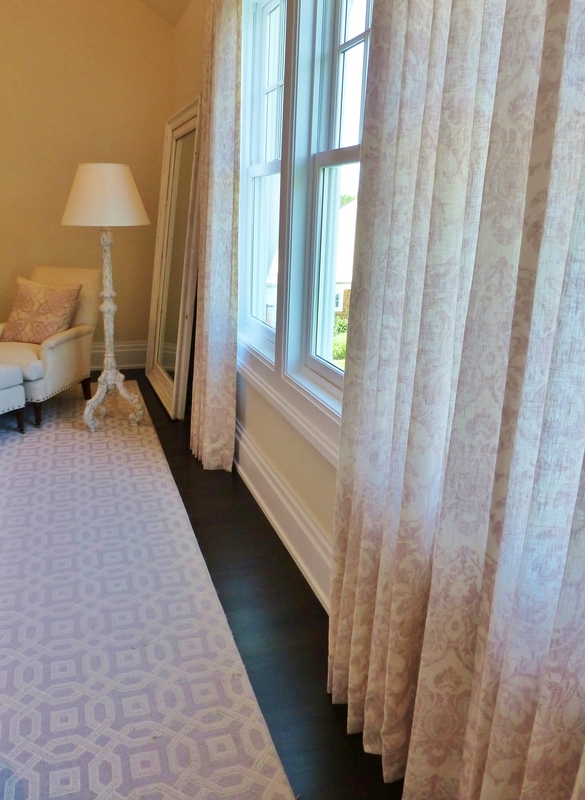 What did you think of this soothing guest bedroom in the 2014 Hampton Designer Showhouse? I’d love to spend a weekend here–the lavender and linen color scheme is very elegant, don’t you think? 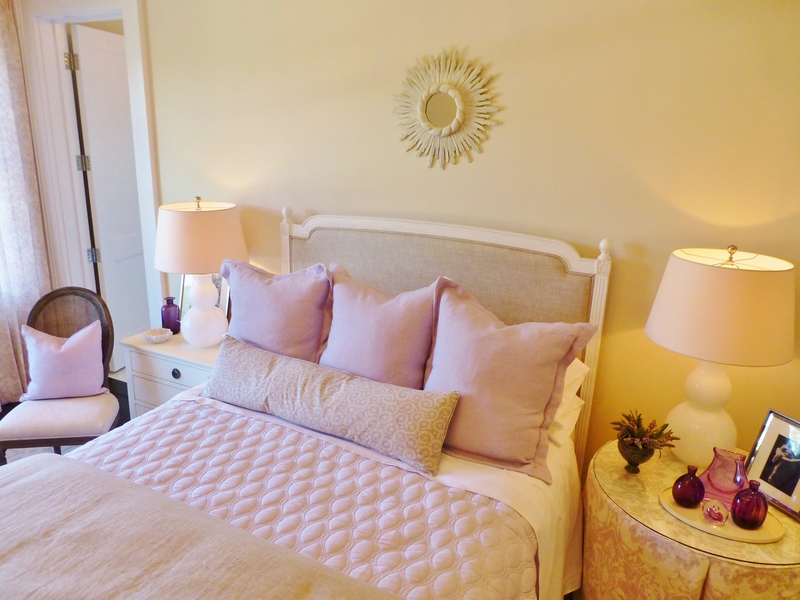 This entry was posted in Designer House, Home Decor, Interior Design & Decorating, Robinson Interiors, The Hamptons, Uncategorized and tagged 2014 Hampton Designer Showhouse, Bedding, Bedroom, Carpet, French, Furniture, Lamps, Lavender, Linen, Pillows, Purple, skirted Table. Bookmark the permalink.